Entry by guestlist before 11pm. Email Progressions with your FULL name (as appears in your ID card) and the names of your friends coming with you before the end of 27 July 2006 (Thursday). No guarantees as guestlist availability is very limited. You are added once you get a confirmation reply. First come first serve. Fred. 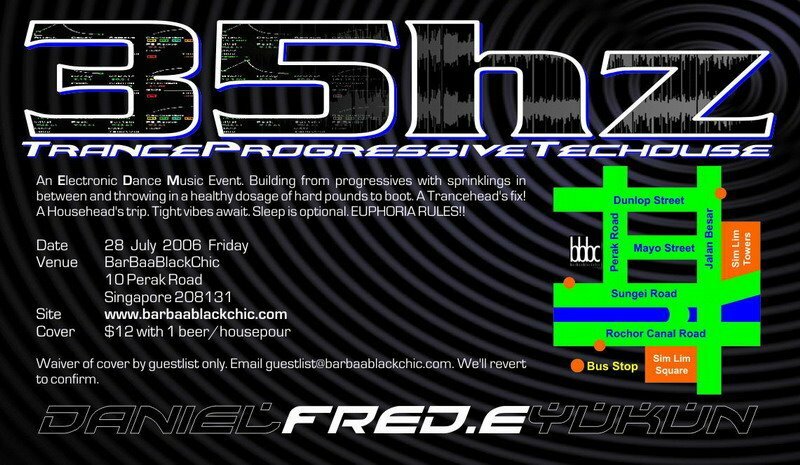 E (aka Frederick) from the Housekeeping collective joins the festivities with his lush and driving progressive house / trance vibes. 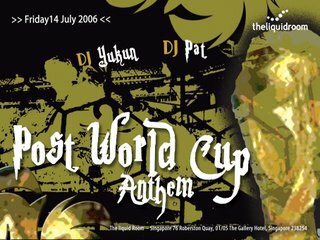 Yukun, Singapore's profilic progressive / trance merchant started his career in 1991 and has garnered over a decade of deck and studio experience. Over the last 5 years, he has played alongside stellar goods like Hybrid, Paul van Dyk, Scott Bond, Above & Beyond, Solarstone, Agnelli & Nelson, Kyau vs Albert, Lange, Thrillseekers, Misja Hesloot, Gareth Emery, Mike Koglin and Matt Darey. He is the persona behind brand nights like the ongoing Progressions as well as Singapore club residencies at Centro and Liquid Room. "Patrick and myself would like to say a huge thank you for all that made it to Liquid Room for the gig. We had tremendous fun and we hope you did to. Thank you for sharing the special night with us! Royally smashed is the word! Really great to see the usual punters who have become a part of our growing family! It was also a great joy for us to meet the new inductees. I've never seen that many shufflers on the floor before. Great to see it finally happening in Singapore! Entry by guestlist before 12 midnight. Email Progressions with your FULL name (as appears in your ID card) and the names of your friends coming with you before the end of 13 July 2006 (Thursday). No guarantees as guestlist availability is very limited. You are added once you get a confirmation reply. First come first serve. P@t, a veteran in the domestic music industry once shared deck duties with Yukun during their formative years. With countless guest slots in Malaysia, Thailand and Singapore under his belt, he returns for his 4th appearance at Liquid Room... promising yet another banging experience... old school style! Sorry this came in a few days late as I was away in Zouk KL over the weekend. That's another story altogether which you can read soon at my own blogsite. A massive thank you for the punters that came for Progressions. 3 years on and yet this one was indeed special beyond words. You had us doing encores 30 minutes after the proposed closing time. We have some amazing photos and will post them up soon. Also a big thumbs up to the new faces that have joined our growing family of faithfuls and friends. Thank you for helping us creating that MOMENT X that we have always craved for. Big ups to Benjamin for yet another impressing outing. And to P@t for whipping the shindig into top gear... and going on and on like the Energizer rabbit. Stay tune for our National Day Eve special... if you remember how mad the one last year was. 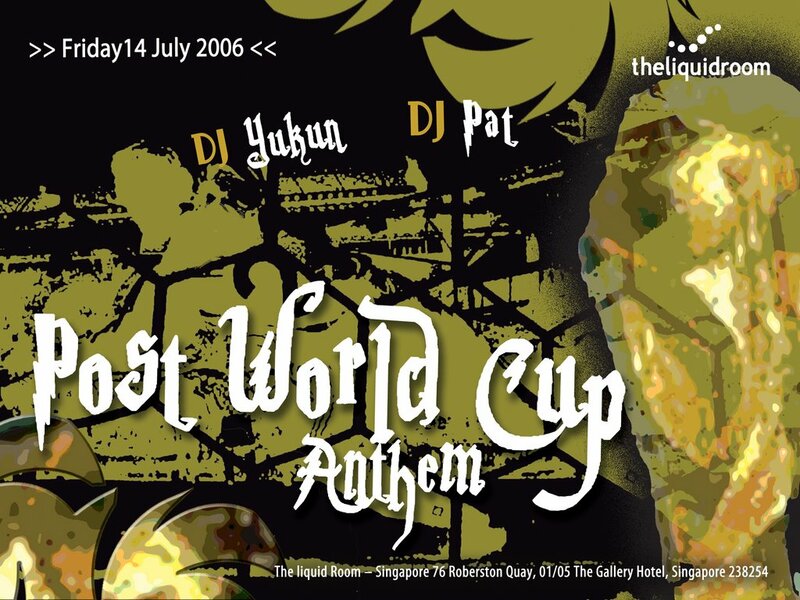 Before the excitement of the World Cup final returns, one of Singapore’s most consistent localized brand night is back from yet another euphoric affair and providing you with what matters most… a good night out! Resident Daniel Storey (UK) will be heating up the engines. Back by popular demand is the fast-rising DJ talent Benjamin (aka CDJ Ben) who did an awesome job when he debut for us last month. 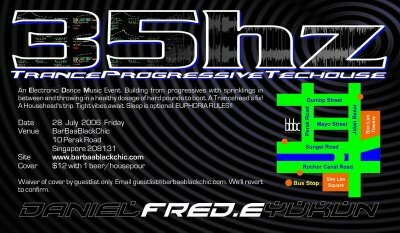 The profilic Yukun will also be dishing out his buffet of upfront tunes. His tag partner P@t will be ending the outing in the way he does best… leaving you gasping for the next one!